Get the chance to meet the staff and students of Bucerius Law School. 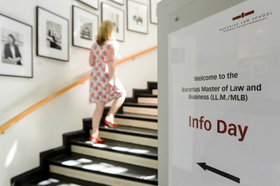 During an introductory case study you have the chance to explore the academic side of the program of the Bucerius Master of Law and Business (MLB). Furthermore, you are able to sign up for a personal study advice session with a member of the MLB team. Futher information is available at www.law-school.de!